I often ask myself what fascinates me so much about Lisbon. Although I was born in Portugal, I came to London as a baby and it’s the city I call home; yet, whenever I’m in Portugal’s capital, there’s so much about it that captivates me. Whether it’s chilling at one of many local cafes to indulge in an espresso and cake (don’t judge me), or taking a walk through the city’s cobbled streets, Lisbon has a totally different vibe to other European cities I’ve visited. 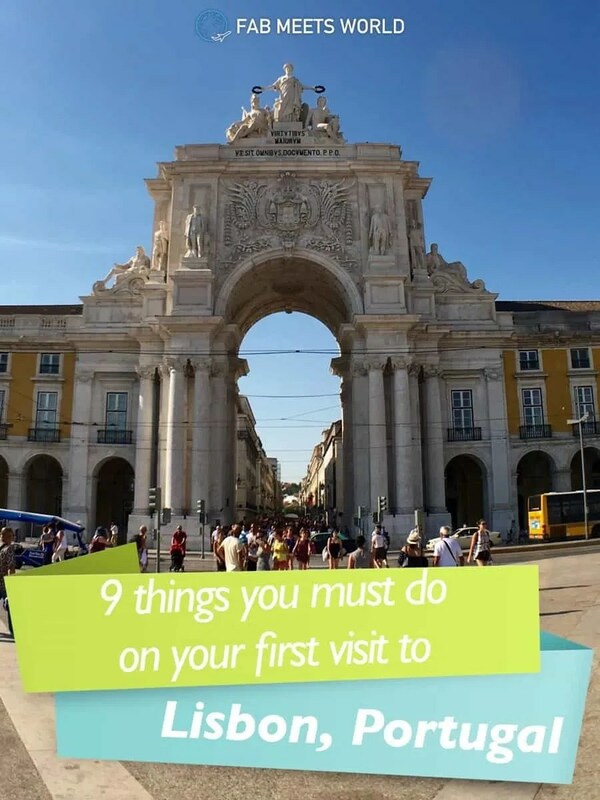 In this post, I wanted to run through 9 of my personal recommendations (in no particular order) for things you have to do when in Lisbon. Think of Avenida de Liberdade as the Champs-Elysees of Paris; a wide boulevard with designer stores, cafes and restaurants scattered across either side. Start at the top of this long stretch at the Eduardo VII Park and you’ll grab a great view of southern Lisbon, and when you make your way down past Marques de Pombal (a large roundabout for all the city’s important avenues) you can explore all the stores down Avenida de Liberdade. There’s a Hard Rock Cafe once you make it down to Restauradores Square along with a great little cafe called Fabrica da Nata that makes their own Pasteis de Nata (egg custard tart) — a Portuguese delicacy. Keep walking south from there past Rossio Square and you eventually make it to the grand Rua Augusta Arch (built to commemorate the city’s reconstruction after the earthquake in 1755) and Praça do Comerçio — a square by the Tagus River where you’ll find bars on either side. You can see both of these in the Instagram post below. Taking this route from Eduardo VII Park down to the Tagus River is essentially the nicest and most cost-effective way to explore the centre of the city. Belem is one of my favourite parts of Lisbon, probably because it’s right by the river Tagus. Almost every time I visit the city, I like to visit the area to devour some Pasteis de Nata and soak in the wonderful views down the river. First up on the Belem to-do list: Torre de Belem (Belem Tower). A UNESCO heritage site and based the furthest away from the city, Torre de Belem was initially built as part of a defence system for Lisbon. You can pay a small fee to go inside, but I usually just grab an Ice Tea from a nearby cart, sit down and enjoy the views from outside. One of the other stand-out spots in the Belem area is the Padrão dos Descobrimentos — a monument celebrating the Portuguese “Age of Discoveries” between the 15th and 16th centuries. You can climb to the top of the monument and enjoy a vast view, but I prefer to admire the intricacy of the sculptures around it. Whether you’re taking a shot during the day or at sunset, this is a great place for photos. Built by King Manuel I in 1502, this is the resting place of Portugal’s famous explorer: Vasco da Gama. Also considered a UNESCO heritage site, the Jeronimos Monastery features beautiful gothic architecture both inside and out. There’s a lovely garden and huge fountain directly opposite too, so if you’re feeling lazy and just want to chill out for a bit — head there! No visit to Belem would be complete without a visit to Pasteis de Belem. The home of the Pastel de Nata and located close to the monastery, Pasteis de Belem is considered to be the place to go if you want to indulge in some Portuguese custard tarts. You’ll often get big queues outside if you want to grab’n’go, but be sure to follow the signs for seating instead — they’re slow on table service, but you’re likely to spend less time waiting! This is a fairly new monument, and admittedly it’s one I haven’t visited myself, but the Museum of Art, Architecture and Technology looks absolutely stunning as an Instagram photo spot. As if its exhibitions and architecture alone aren’t reason enough to go, you’ll also be perfectly situated for views of the Ponte de 25 Abril bridge and the statue of Jesus across the river. Often compared to the Golden Gate Bridge in San Francisco, Ponte 25 de Abril (25th of April Bridge) is one of the largest suspension bridges in the world with a total length of 2,277m. The main bridge has 6 lanes — 3 on either side — and there’s a train platform beneath connecting Lisbon to the southern side of the river. On that southern side of the river you’ll immediately notice a statue of Jesus Christ — inspired by the one in Rio, Brazil — which is another place you’ll want to go and take some snaps. Originally built by the Moors in the 11th century and based in the old part of the city called Alfama, Saint George’s Castle has plenty of history so it’s definitely worth a visit. It consists of the castle itself, ruins of the former royal palace and part of the neighbourhood for the elite. You do have to pay for entry, but it’s worth paying for since you get one of the best views of the city from up there — as you can see from the photo of me and the Mrs above! Sintra is one of Portugal’s gems, and anytime someone visits Lisbon I encourage them to take a day trip to this beautiful coastal region. Just 25 minutes away by car, Sintra is home to lovely landscapes, close to beautiful beaches, and hosts some of the country’s most charming castles and palaces. Let’s get Pena Palace out of the way; it’s the palace to visit when you’re in Sintra. Perched on top of tall hills in Sintra’s mountain range, Pena Palace can be seen from miles away with its colourful towers and interesting mix of Neo-Gothic, Neo-Manueline, Neo-Islamic and Neo-Renaissance architecture. Take a roam around the palace and you’ll undoubtedly be impressed by the bold colours, unique style and most of all, the vast views of the Portuguese landscapes. In fact, on a clear enough day you can even spot Ponte 25 de Abril and the Jesus statue from up there. Like Pena Palace, you can easily spot the Castle of the Moors from Sintra’s town centre and once you make your way up there you’ll get some jaw-dropping panoramic views of the Sintra landscape. There’s a lot walking involved and with slopes at about 40% gradients, you may want to take comfortable clothes and footwear with you. If you’re keen on seeing amazing views it’ll be worth it though. Monserrate Palace is one of those places that will make you ask: “Am I still in Portugal?”. With wonderful green gardens surrounding it, this exotic palace is made up of an interesting combination of gothic, Indian and Moorish architectural influences. Admittedly the inside of Monserrate Palace doesn’t have much on show, but its architecture and interior design alone is enough to make it worth the visit. And when you’re done, take a breather on the grass outside the palace to take in the gorgeous landscapes. My favourite spot in Sintra after Pena Palace. During this summer of 2016 my wife and I booked a short stay at the 5 star Sheraton in Lisbon. With bragging rights for the highest views of Lisbon and an extravagant panoramic bar & restaurant on their top floor, it seemed like a good way to end our honeymoon. From here you get views over most of the city, so you’re expected to pay for the luxury. Drinks were in the region of €15 for a cocktail and a main course can be anywhere between €20-€50, but remember, you’re paying for the view and a 5 star venue. Even if you don’t actually stay at this hotel or sit down for a meal, I’d say it’s worth a visit just to grab yourself a cheeky cocktail and appreciate the view. So as a foodie, I’m obligated to make a visit to the food market Mercado da Ribeira (also known as TimeOut Market) every time I go to Lisbon. Walk into the large, main dining hall and you’ll be overwhelmed by the choices; whether you fancy some Asian Pad Thai & Gyozas, Italian pizzas or authentic Portuguese grilled chicken, this food market has you covered. It feels a little hypocritical suggesting Bairro Alto considering I’ve never been for a night out there, but literally everyone I speak to in Portugal hypes up this place. You’ll often see people drinking out on the streets and having a good time, so if you’re looking to have a good night out it’s totally worth going. (And let me know how it goes!) Just remember: keep your stuff close to you at all times and pay attention; unfortunately like so many other capital cities, Lisbon is a target for pick-pockets. So there you go guys & girls — those are my 9 suggestions on what to do as a first timer in Lisbon. It’s honestly a beautiful city and has a lot to offer; just remember to take it slowly, stop at a cafe to soak in the atmosphere every once in a while and enjoy. Is there anything in particular on this list you’re excited to visit? Let me know in the comments!